The Adventures of Superman TV show was a 30 minute fantasy series that aired in syndication. It was about a "man" who came from the planet Krypton as a child. He had super powers due to the differences between the qualities of Kryton's star and our Sun. His powers included the ability to fly, super speed, super hearing and sight, x-ray and heat ray vision, super strength, and invulnerability. The only thing that could harm him was Kryptonite, an element created when his home planet Krypton exploded. He also has the alternate, secret identity of Clark Kent ("a mild-mannered reporter for the Daily Planet") so that he can live amidst we Earthlings and lead a (mostly) normal life. The series' scripts centered around Superman's efforts to protect we normal humans from "super" criminals and his problems in keeping others from learning that he is also Clark Kent. There was also a Superman Radio Show that ran for 11 years from 1940 to 1951! "Kryptonite" was introduced in 1943 on the Superman Radio Show. It was, of course, intended to add to the suspense of the show but it also allowed the actor who played superman, "Bud Collyer", to get some time off once in a while while his character, "Superman", was held hostage or some other such thing by an adversary using Kryptonite. In the early years, the first names of Clark Kent's parents were not clear. They were not mentioned often in the comics until the early 1950s. In the pilot for this series, "Superman And The Mole Men", their names were "Eben" and "Sarah"! By the first regular episode, their names had been changed to Johathan and Martha and they've been that ever since. 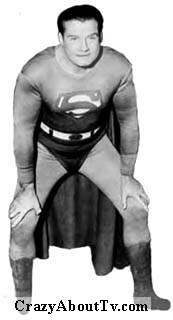 Seasons 1 & 2 of the Adventures of Superman were filmed in black & white. Superman's costume was brown and white during that time because blue and red tend to blend together when filmed in black & white. When season 3 came around, they switched to color film and the costume was changed to its true blue and red. For some reason though, the first season 3 episodes were broadcast from black & white prints of the color negatives. George Reeves guest starred as Superman on the "I Love Lucy show" in the episode titled, "Lucy and Superman". Ricky tried to use his showbiz connections to get Superman to come to Little Ricky's birthday party, but failed. Lucy dressed up as Superman and then the "real" Superman showed up! The production budget for the Adventures of Superman was very tiny. To cut expenses, they would shoot all of the scenes on a particular set at one time for many different episodes. The Cast weren't given enough time to change into different clothing so you'll see the characters in the same clothes in many episodes. The Cast were paid a measley $200 per episode. At one point, after begging the producer to raise their salaries to $250 per episode, he reluctantly gave in. It caused some real hard feelings on the set. The producer felt that the cast was too greedy and didn't speak to them for two weeks! When Kellogg's Cereals became the sponsor, it gave the Adventures of Superman Cast an opportunity to make some extra money doing cereal commercials. Unfortunately, the two actresses who played Lois Lane weren't included because Kellogg's felt that having Lois and Superman eating breakfast cereal together might be a bit too suggestive for 1950s audiences! Noel Neill did get an opportunity to cash in on her Lois Lane role. In 1957, she and George Reeves performed at county fairs! Noel sang and George played the string bass. Noel also got a cameo appearance in film, "Superman (1978)", appeared as a guest star on the TV series "Superboy", and also appeared in the movie, "Superman Returns (2006)". George Reeves was found shot to death in his home. The circumstances have never been determined. Murder was not ruled out but many believe that George committed suicide due to depression over being "typecast" as Superman (and other reasons). George always took his duty as a role model very seriously though. He quit smoking because he didn't want kids to think that was a good thing to do and he never brought any of his girlfriends with him when appearing in front of kids. George also had a reputation for "standing up" for crew and Cast on The Adventures of Superman whenever he felt someone was taking advantage of them or otherwise not treating them properly. Although it is circulated that he was depressed over being labeled Superman, and that it inhibited his future career, he took the part of "role model" seriously, even to the extent of quitting smoking and not making appearances around children with his girlfriends. If you're interested, take a look at our other "Super" TV series' pages: "Superboy (1988)", "Lois and Clark (1993)", and "Smallville (2001)". Yes, it's Superman! ... Strange visitor from another planet who came to Earth with powers and abilities far beyond those of mortal men. Superman! who can change the course of mighty rivers, bend steel in his bare hands. And who, disguised as Clark Kent, mild-mannered reporter for a great metropolitan newspaper, fights a never-ending battle for Truth, Justice, and the American way! Thank you for visiting our The Adventures Of Superman TV Show page!